THE TEERITZ AGENDA: Sunday 5/6/2016 - Happy Birthday, I.F., Olympia SF repairs, Watching Stage & Screen & This Week's Wristwatches. Sunday 5/6/2016 - Happy Birthday, I.F., Olympia SF repairs, Watching Stage & Screen & This Week's Wristwatches. I have to admit that, now that I'm working at a job that requires a lot of computer work throughout the day, I'm less inclined to spend large amounts of time on the web when I get home. Which is why these weekly posts have bee a little sporadic lately. 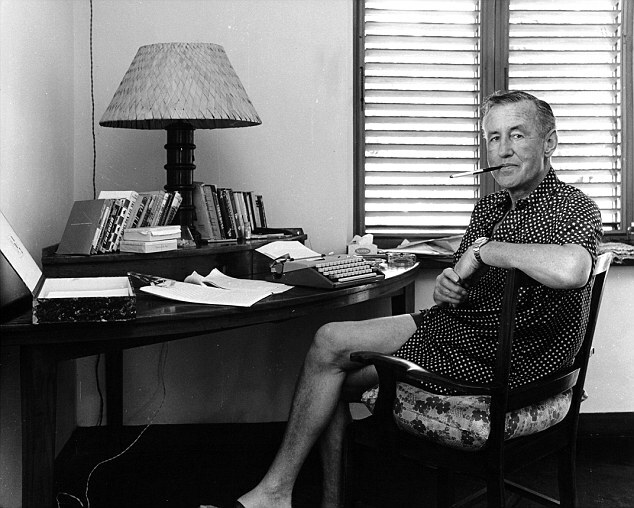 May 28th marked 108 years since Ian Fleming was born. Probably another reason why I had a mad yearning lately for an Olympia SF. This looks like such a pleasant writing space, I must say. No distractions. Certainly no major time-wasters such as the internet. Just some natural lighting, probably with a nice view outside that window at Fleming's Jamaican retreat, which he called Goldeneye. Much has often been written about Fleming's gold-plated Royal Quiet De Luxe typewriter that he bought himself after the publication of his first Bond novel Casino Royale, but he was also known to have used other machines such as this SF, as well as a Triumph Perfekt. I'm thinking of maybe giving this one a new paint-job at some point. Something with a Flemingesque touch. A Summer project, no doubt. I got a call at work later in the week from my kid's school. Somebody from the office told me my son had just thrown up and was looking pale. I had a dental appointment scheduled for later that afternoon, but I left work early to go pick him up and take him home. It appeared that he had a touch of gastro, so I parked him on the couch and kept an eye on him before heading off to the dentist. He was okay. He was lying on the couch with a peppermint tea in his hand and Raiders of The Lost Ark on DVD. Friday afternoon, I finished work later than usual, then headed into town to meet up with the family. 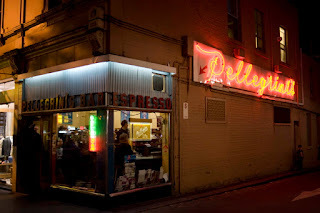 We had a quick bite at Pellegrini's, a small Italian bistro which has been a Melbourne institution for decades. I worked at a very similar place in Carlton for five years back in my hospitality days. Pellegrini's was packed, as usual. It serves a basic menu of basic Italian pastas at a reasonable price. It's famous for its coffee. They don't do pretty leaf patterns on the milk (at least, I hope not! ), but trade is very steady in this place. It has a long bar along one side and a long bench-top along the opposite wall, which is mirrored. As I said, the place was full. However, Pellegrini's has a narrow table right inside the kitchen and that is where we sat. It was nice and warm in there too. I had the carbonara. I was still a little wary of my son's tender stomach, but he insisted that he could handle a bowl of pasta so he ordered the gnocchi. We still had some time to kill after the meal, so we took a walk through the city. It had been raining lightly all evening and the air had a definite chill to it. We didn't tell the kids, but we had a surprise in store for them. My wife had said a long time ago that we should try and do something different from time to time as a family. Which is why we've taken the kids to various things like the Hollywood Costume Exhibition And the David Bowie Is Exhibit at the Australian Centre for the Moving Image. Last year, we went to a regional production of 84 Charing Cross Road, to give them a taste of theatre, in the hopes of broadening their minds and experiences, and perhaps get them to appreciate more than what the internet and the Playstation has to offer. These things are fine, and unavoidable, but they're not the only game in town. So, we continued to walk through the city, but we made our way to Her Majesty's Theatre on Exhibition Street. We were going to the 7:30pm performance of Singin' In The Rain. It was a great show. Standout performances from the leads. Adam Garcia had the lead role of Don Lockwood, a silent-era actor who meets and begins falling for a novice actress named Kathy Selden (Gretel Scarlett). Special mention goes to Erika Heynatz, who plays Lina Lamont, Lockwood's co-star in their silent movies, and she's under the impression that she and Lockwood are an item, because she reads that in the gossip columns. 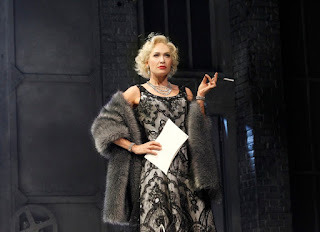 Heynatz equips platinum blonde Lina with a grating, high-pitched voice covered in a thick Noo Yawk accent, channeling Judy Holliday, with a tiny dash of Monroe thrown in. It looks exhausting and later on, when she performs a song titled What's Wrong With Me, you marvel at how she can maintain the voice for so long and so loud. It's a larger than life character and she maintains it throughout. Heynatz displays a great comic timing with her performance as well. Full marks also to Gretel Scarlett as Kathy Selden. A wonderful singing voice, highlighted by a beautiful rendition of Would You. Basically, folks, if you're in Stalls, Row A or B, you're gonna get wet. When I worked as an usher at the Victorian State Theatre back in the '80s, I was always amazed at how clever the set designs were for some of the shows that I saw. The street-scape in this musical is slightly recessed in the middle and all this water runs into a slight gap around its edge, effectively draining away. This is the musical number which we see just before intermission, thus giving the stage-hands twenty minutes to mop up any excess water and get the floor dry again for the second act. It was a great show. The choreography was sharp, the dancers were limber. Co-star Jack Chambers played Lockwood's best friend, Cosmo Brown, and he had a great 1930s, Gershwinesque face. He did a great version of Make 'Em Laugh, made famous by Donald O'Connor in the original 1952 movie. The circa 1969 Omega Seamaster Chronometer. Saturday night rolled around and I had an idea. My son and I would catch a movie while my wife and daughter watched Steel Magnolias (Dir; Herbert Ross, 1989) on DVD. So, teeritz jr and I hit the local multiplex to see The Nice Guys, directed and co-written by Shane Black. Black wrote the screenplay for Lethal Weapon back in 1987. He earned a record $4 million dollars for his screenplay for The Long Kiss Goodnight (a favourite of mine) before finally getting into the Director's chair with another screenplay of his, Kiss Kiss, Bang Bang in 2005. He recently co-wrote and directed Iron Man 3 in 2013 and, while it had a different vibe to the two previous Iron Man films, I thought it was great. There is a scene in it where a bunch of people are flung out of a passenger jet and Tony Stark/IronMan (Robert Downey Jr) has to rescue them before they plummet to their deaths. He scans the passengers as they're falling. There are thirteen of them. He quickly consults with Jarvis, the AI system that controls his suit, which tells him that he can only hold the weight of nine people with his enhanced strength. It's a tense and wonderfully done scene and I felt my eyes well up a little. A few days later, I read a review of the film in the newspaper and the reviewer mentioned a scene involving 'falling airline passengers' which he found oddly moving. So I wasn't the only one. The Nice Guys is a pretty funny film. I won't go too much into the plot, but it's set in 1977 and follows an inept private investigator named Holland March (Ryan Gosling) as he half-heartedly searches for a missing person. Meanwhile, Jackson Healy (Russell Crowe) is a local enforcer-type who gets caught up in March's 'investigation' when it turns out that they are dealing with the same missing person, but from two different angles. I have to say that Crowe and Gosling work great together, making this the kind of buddy movie that we seldom see anymore. 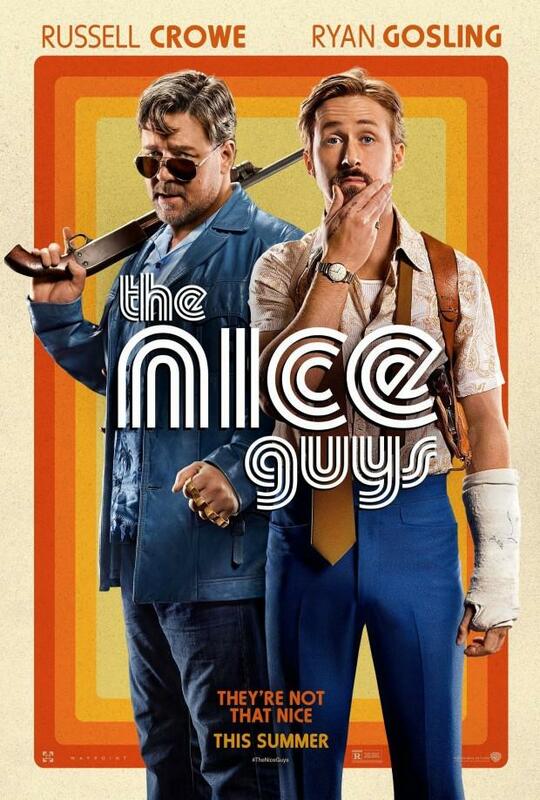 The characters are very well written and Gosling is hilarious as he tries to show that he's a professional detective. We also get a great performance from Angourie Rice as March's daughter, Holly. Her presence in this film lends it some further heart. Russell Crowe once again proves himself to be one of the finest actors of his generation, in a role that looks like it was written for him. I'm always impressed by what he does on-screen. It was good seeing this movie. During my continuing clean-up and unboxing of stuff around the house, I came across some audio tape recordings of screenwriting seminars conducted in Los Angeles back in 1994. We sold these at the film bookstore where I used to work. One of these tapes featured Shane Black talking about his motivations and methods for writing. So I was playing this tape in my car on the way to and from work each day because it's the only tape deck I have. 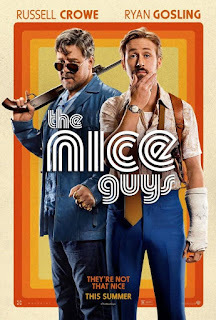 The Nice Guys is a very entertaining film, and I look forward to watching it again when it gets its DVD release. This year's been a real dog in some ways. I didn't follow boxing, and I only know a minuscule fraction about Ali's career, but he was a one-of-a-kind. Sure, he had a uh..'healthy' self-esteem, but it was deserved. Thanks for reading, and have a great week, y'all. Great update, and I'm glad to see see more typecasts. I liked that bit of detective noir, perhaps the start of something big? Good to see you're getting your head into your role. I love that point when you feel you've mastered it, and you feel like the world is yours. You know, I've been itching to see both Nice guys, and Singing in the rain. You're not making this any easier! @ Joe V, thanks. I figure I can do a mix of typecast and PC for these posts. @ Scott K, yes, I'm getting the hang of it. Still a few niggling issues to master, but otherwise, it's going okay. 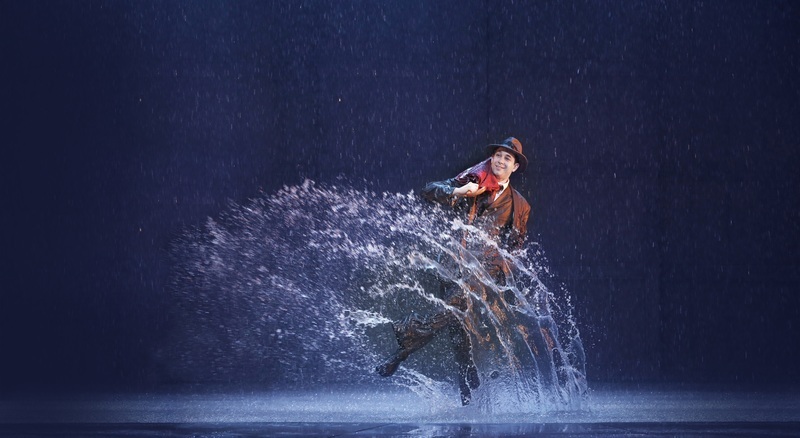 "Singin' In The Rain" is worth it. Our seats were in the first couple of rows in the Dress Circle. Not cheap, but the view was great.